← Congratulations on book drawing! Don’t you just love daffodils? There are masses of them planted along the roadsides here in Almere, the Netherlands. Right now, they’re at their peak. Grape hyacinths with their little purple clusters are also in full bloom at the moment. I think my stories are influenced by the seasons I write them in. My current WIP begins in spring but is now inching into summer. These nice (rare) sunny days we’re enjoying this week are certainly helping. This entry was posted in daffodils, spring. Bookmark the permalink. Hi, Ruth. 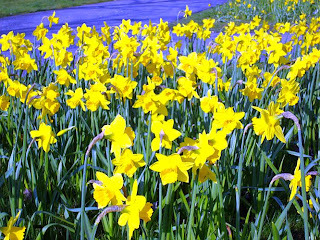 Seeing that “host of golden daffodils” just now gave me a little thrill. My daffs and grape hyacinths have just begun to bloom, so today I picked the first bouquet for my kitchen table. Tomorrow I’ll grab another handful to decorate my desk. I’m looking forward to reading HEARTS IN THE HIGHLANDS. I’ve been saving it for a rainy afternoon treat. Nice to see you! I’ve missed your blogging. Post a photo of your daffs & grape hyacinths on it, why don’t you! Hi Ruth – Those are gorgeous. Spring must be beautiful in the Netherlands.